“Ask Anna” needle felting tutorial session! For those of you who have questions about needle felting, I will have a table set up to answer your questions, give you tips and share tricks at the next Potwin Fiber Artisans Open Stitch night-Wednesday, May 30th, from 7-9pm at the Potwin Presbyterian Church located at 5th & Washburn. Bring the project that is vexing you, and the tools you have been using, and I’ll bring along samples of the tools I use with successful results for comparison. No fee-just come to Open Stitch and “Ask Anna”! I had the opportunity to assist my friend, Cathy Anderson, and her godmother, Peg Hazlett, in throwing a bridal shower for Cathy’s soon-to-be-daughter-in-law Betsy. No games were allowed, Cathy’s rule, so I was the one designated to be the “crafty organizer:. And, while the creation of a bridal quilt is nothing new, in fact is very traditional, we had fun with our interpretation. Peg purchased a number of fat quarters in the colors of the wedding, blue and yellow, and I prepared muslin squares for embellishment by the shower guests. 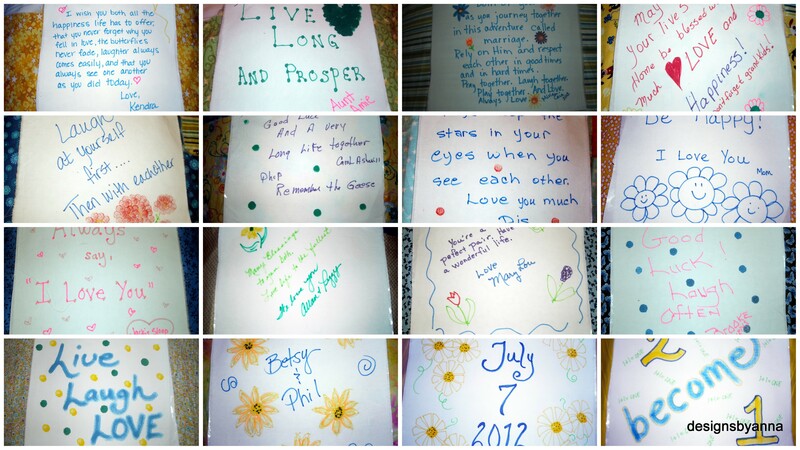 Each guest was invited to utilize fabric markers to create a message, a wish, a prayer, or just to pass along a family saying. They then chose the fat quarter they wanted to accompany their message, and I’ll be creating a quilt for the happy couple to be displayed at the wedding in July. I’ll post more progress photos as the quilt progresses!